Perfect North Slopes, along the Indiana, Kentucky border near Cincinnati, is holding its Spring Carnival Sunday March 1, which includes lots of family-friendly activities. The deck is open for those who like to watch. Michigan’s Shanty Creek is hosting its popular spectator event The Monster Energy Slush Cup Saturday, March 7. It’s been the resort’s most popular spectator event for over 40 years. Another spectator friendly event. the Cardboard Classic, is March 14. There are both adult and junior divisions for this popular competition. Shanty’s lift and lodging packages start from $89 per person, per night, and include breakfast and a group lesson. Children eight and under always sleep and ski free when staying with parents. 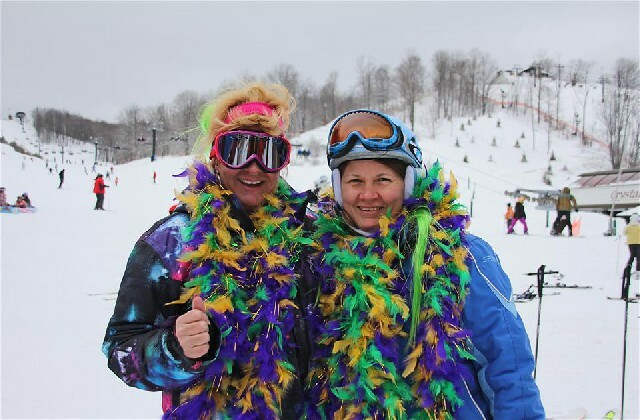 Crystal Mountain plans Mardi Gras on the Mountain March 7. Dress in full Mardi Gras regalia and receive $10 off a full day lift ticket. Events include the bead scavenger, face painting, costume contest, Cajun cuisine at the Wild Tomato and Thistle Pub & Grill. Finish the day with the Mardi Gras Party featuring live music in the Vista Lounge. Stay dressed in costume and receive one dollar off your drinks. Timber Ridge, in southern Michigan, is holding its Winterfest this weekend, Friday, Feb. 27, through Sunday, March 1. It’s a fun filled weekend with music, fun races, a cardboard classic, penguin slide, a party on the deck, and snow sculpting. You’re encouraged to come in costume. 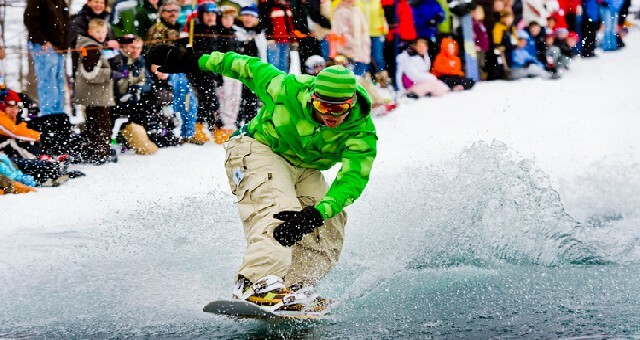 Ohio’s Mad River Mountain hosts the Sping Fling Pond Skim & Cardboard Classic Saturday, March 7. Last year’s pond skim was so popular they are expanding the categories and prizes this year, and a costume is required to compete. The theme for this year’s Cardboard Classic is, what else when you’re in the Buckeye State, Ohio State’s National Championship. Indiana’sPaoli Peaks Spring Carnival is March 7. It’s a family themed day filled with music, games and contests on the slopes. 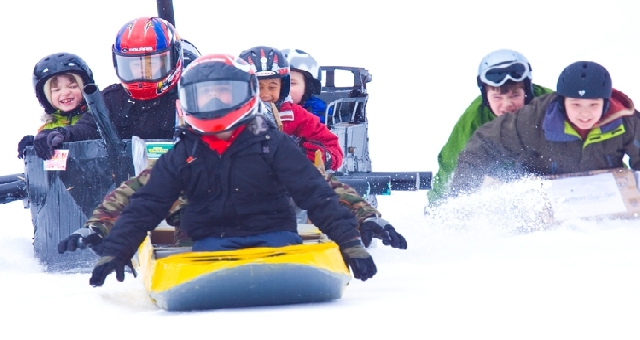 There’s a cardboard sled race, snow golf, a slosh pit jump, bikini race and costume contest. Show up before noon in full costume and receive a free lift ticket. Rental equipment is $29 for the day. Wisconsin’s Granite Peak, overlooking Wausau, is hosting its last Family Festival Weekend of the season March 6-8. Lodging packages for a family of four start from $545 for the weekend and include lift tickets, ski or snowboard rental, horse drawn wagon rides, night skiing Saturday night plus a big bonfire to sit around and watch the firework display over 700-foot Rib Mountain. If you’re coming up from Chicago or Milwaukee it’s an easy drive, all interstate.